Mangoes probably aren’t the first fruit you reach for in the produce aisle. But they’re full of flavor with health benefits to match. So in honor of national mango month (who knew? ), here are five reasons to eat more of this tropical fruit. 1. Help Fight Cancer: The antioxidants in fruits like mango can help reduce inflammation. This may help lower your risk of facing cancer. But researchers in Texas found that adding mangoes to your diet can go even further in helping to prevent breast and colon cancers. The polyphenols in mangoes helped kill cancer cells while keeping normal ones alive and well. 2. Preserve Sharp Vision: One study found that eating three servings of fruit each day can reduce the risk for developing macular disorders by up to 64% in people over 50. But mangoes are rich in zeaxanthin and lutein. These substances can help prevent cataracts and macular degeneration. They’re two common causes of irreversible vision loss in adults. Eating mangoes may help you keep them at bay—or avoid them entirely. 3. Support Heart Health: Mangoes are rich in antioxidants. They help fight oxidative stress and reduce inflammation—two major factors in developing heart disease. Mangoes are also a sweet source of fiber. Research shows that you may be able to lower heart disease risk by about 9% for every seven grams of fiber you eat in a day. One cup of sliced mango can give you around three grams of it. It’s a good way to get more fiber at breakfast without relying on inflammatory grains. 4. Keep Skin Young: One of the best ways to help skin look younger is to make it tighter. The vitamin C in mangoes can help you do that. It supports collagen production. More collagen means firmer, suppler skin. It may also help protect against—and reduce the appearance of—sun damage. You can also use mango slices topically to help unclog your pores. Just leave them on for at least 10 minutes and gently wash your face afterwards. 5. Boosts Brainpower: The vitamin B6 from mangoes may help you improve cognitive function and increase your attention span. One study found that lower levels of B6 led to decreases in focus and cognition in seniors. Not having enough may also mean poor memory—and even depression. The B6 found in mangoes will give your brain the fuel it needs to run at top speed all day. 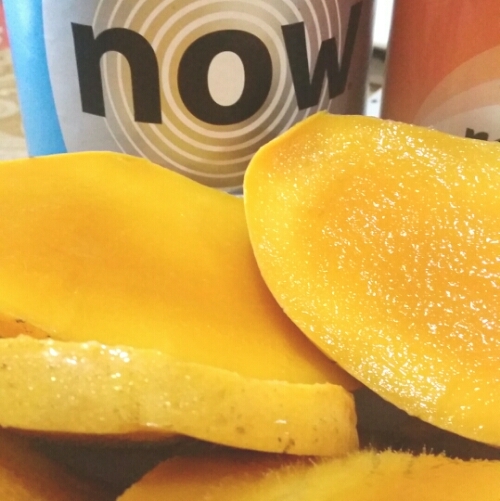 Mangoes may not have more B6 than fish or sunflower seeds… But they certainly go better at breakfast. Try adding mangoes to a berry salad or smoothie at breakfast. If you’re feeling extra adventurous, you can top a green salad with it or make tropical mango chutney with your grass-fed beef or wild-caught salmon at your next barbecue. Previous Post Younger Next Week? Upgrade to Super You 2.0 Today!